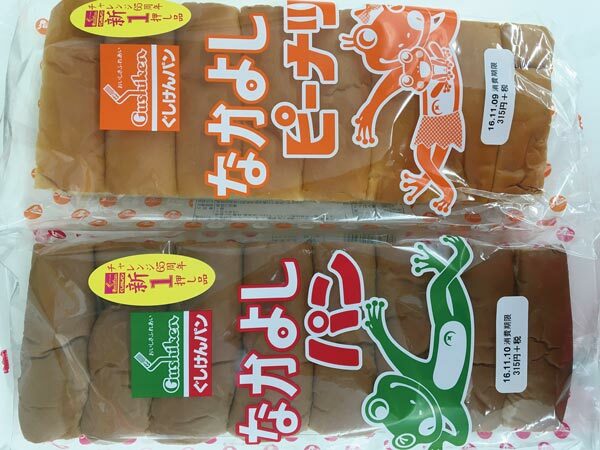 Most grocery stores on Okinawa sell a very large sweetened bun called Nakayoshi pan. It’s so large that some people compare its size to a Japanese pillow. 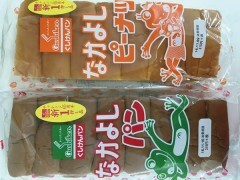 “Nakayoshi” means a close or good friend and “pan” is bread in Japanese. Creators of this large bun hope that people eat it together with their family and friends. It costs ¥315 including the sales tax. The bun has butter cream between cocoa flavored layers of bread. It has right cut lines to separate it into eight equal pieces. It’s soft and therefore easy to tear apart. Actually, it’s really better to share with family and friends because the whole bun pack a whopping 1,333 kcal! Since 2014 there has been a variety with peanut flavor, but it’s still the same size as the original Nakayoshi pan with the same calories. Some shops sell half-size Nakayoshi pan as well. Maybe trying the half-size would be a healthier way to try it first.